Last week we visited Bard Rock. That’s a large outcropping of sandstone and shale located at the northern end of the Vanderbilt National Historic Site in Hyde Park. The National Park Service operates a number of hiking trails there and you can take one to the Bard Rock site. The rocks here rise to a gentle peak and trees have grown in where soils formed between the rock exposures. It’s a nice location, ideal for picnicking – and for looking at geology. The two of us were down there filming videos about the geology of the whole Vanderbilt estate and we wanted to include Bard Rock. Last week we wrote about the history recorded in the bedrock. Those sandstones and shales formed in the depths of a very great marine abyss. This week let’s see if we can figure out the ice age history of the same location. Take a good look at the photo here. You will see horizons of sandstone and shale. The hand is pointing at a fine thick stratum of sandstone while the foot is on a horizon of shale and grass is growing on another shale. The hand is purposely hovering over evidence of the ice age. Notice how polished the sandstone is; that surface, although sloping, is really quite smooth. What happened is that the Hudson Valley glacier, many thousands of years ago, advanced across this outcrop. The glacier carried large amounts of sand, concentrated at its bottom, and that sand did what sand is good at: pressed by all the weight of a very heavy glacier, the sand ground into the bedrock and – sanded it. It smoothed it off into the surface you can see there today. If you visit this site and step back a bit, you can see that this surface extends up and down the outcrop. Or you can look at the photo we published here last week. You rise up from the outcrop and gaze across the whole Hudson Valley. In your mind’s eye you fill that valley with ice. There is quite a bit of it. It is hundreds and, more likely several thousands of feet thick. We have gone back in time and visited this site at the peak of the Ice Age, changes your perspective on things, doesn’t it? But there is more. Take another good look at the illustration. Notice that the hand hovers over some scratches in that glaciated surface. 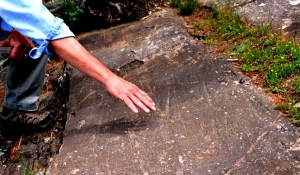 These are called glacial striations. The Hudson Valley glacier didn’t just carry sand; it swept along a large number of pieces of gravel and cobbles as well. Every time one of these bits and pieces of rock was dragged across this surface it left a scratch. Most of them have north-to-south compass orientations. That can’t be much of a surprise. Not only do most glaciers travel in a southward direction but the Hudson Valley glacier was confined and funneled within its north-to-south oriented valley. But there are some exceptions to that rule. A few of those striations trend from the upper right to the lower left. That sounds like it should not be, but there are explanations. Very late in an ice age, it is not uncommon to have one final advance of the ice. That last-gasp glacial advance is likely to be very small and so it is not pushed so much from the north as it is steered by some unknown local feature. Typically glaciated surfaces are like this one; they have a lot of north-to-south striations and a few local exceptions. Those exceptions dress up the exposure and speak of minor events at the very end of the glaciation. There is nothing all that rare or unusual about this exposure of ice age features. There are a lot of similar sites all up and down the Hudson Valley. In fact there are a lot of such sites all across the northern half of North America. Wherever the glaciers traveled they left features and exposures just like this one. These are among the most widely seen evidences of the Ice Age. They are the sort of thing that all geologists are accustomed to look for and to see. Though common, we never get tired of finding things like this. We like to bring compasses along and measure the compass directions of similar striations. We plot arrows up on maps and thus document the pathways of once advancing ice. What’s special about these striations is the scenic site where they are found and which they helped form.